Super EPA Fish Oil, 60 softgels (Nature's Wonderland) - Penn Herb Co. Ltd. Essential fatty acids cannot be manufactured by the body and must therefore be supplied through the diet. These extraordinary nutritional oils support memory, heart health, joint mobility, skin health, and more! 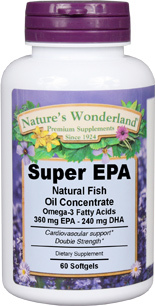 Our Super EPA Fish Oil concentrate supplies an extraordinary 720 mg EPA and 480 mg DHA per serving! Nature's Wonderland Super EPA is guaranteed for purity, freshness, and labeled potency. As a dietary supplement, take 2 softgels 1-2 times daily with meals.